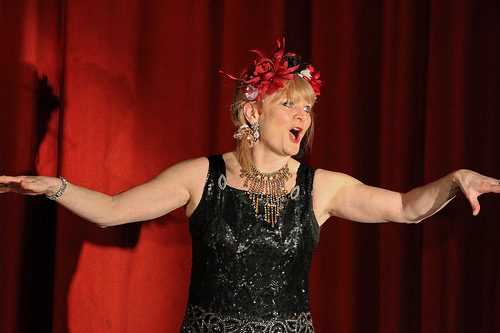 Was the Dulwich Player's latest production, the pantomime Cinderfella, worth going to see? Oh yes it was! If I'm completely honest, I'm not a fan of pantomimes; without children in tow they can feel hammy and silly and a bit too much like you're the weird grown-ups at a children's party. But I actually thoroughly enjoyed Cinderfella, despite the cold and rainy Dulwich evening. 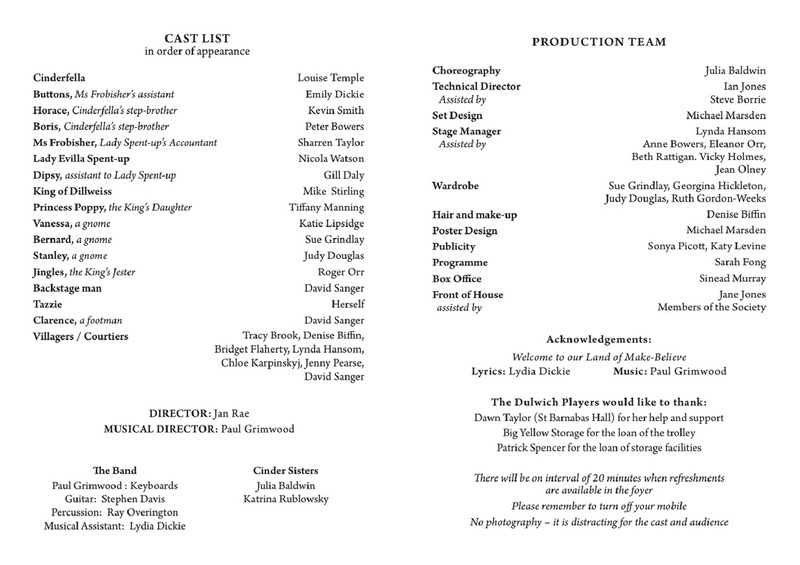 Cinderfella was written by two of our own, Lydia Dickie and Mike Foster. Not an easy task at all but it was splendid – what was most enjoyable about the script was the twists on the classic Cinderella as well as the inclusion of lots of local 'in' gags...poking fun (kind heartedly, of course) at Dulwich itself as well as lots of local geographical and pop culture references. 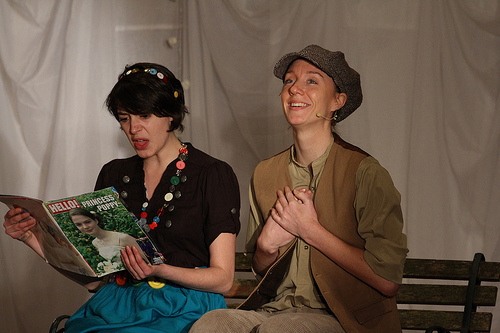 Cindefella (Louise Temple) was a believable and engaging leading lady/chap and the female Buttons (Emily Dickie) was delightfully cute yet smart side-kick, strewn in brightly coloured button laden accessories. Boris and Horace (Kevin Smith and Peter Bowers) made a great comic duo of hideously stupid upper-class twits, whose hideous dancing had us all giggling. Lady Evilla (Nicola Watson), her accountant Mrs Frobisher (Sharren Taylor), and side-kick assistant Dipsy (Gill Daly) were suitably dislikeable and well worth a good 'booooo' every now and again. And Gill Daly can certainly hold a tune! Let us not forget that Cinderfella required its cast to sing, as well as act, which is a skill that (unless you are a professional) can be thoroughly nerve racking....but none of the voices disappointed. They were all brilliantly supported by a live band led by Paul Grimwood. Having a live band added something special to the production, making it more exciting and with a less 'amateur' feel than a CD on a poor quality sound system would have had. The King of Dillweiss (Mike Stirling) and the sickly pink Princess Poppy (Tiffany Manning), who had popped straight out of the pages of a fairytale, were a suitable balance between sugary sweet and comically silly. 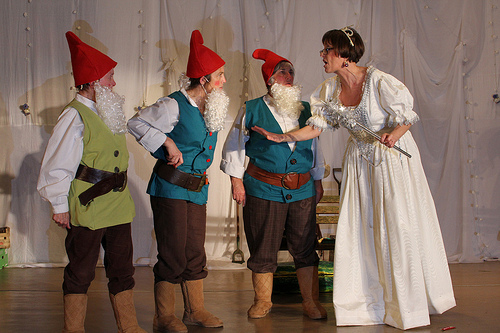 All the villagers, courtiers and gnomes were lovely touches (in great costumes, thanks to the Wardrobe team!) as well the use of the real-live Tazzie the dog who came on stage to pull Cinderfella's stage coach, garnering plenty of 'ahhhhsss' from the audience. 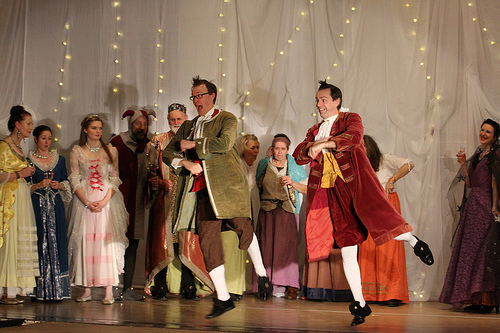 The final cast mention must go to Mr Jingles (Roger Orr) who had me in stitches with his perfectly judged little jumps and jingles of his bell as the court jester. The crew clearly did a great job as always, from font of house to make-up, to stage management to set design. My only complaint would be that we struggled to see the set, which is always a problem with a raised stage. Also, whilst the songs were belted out with suitable force, some of the lines were lost as the cast dipped in their projection, which needed to be fully utilised in such a big echoey hall. All in all, Jan Rae directed a performance to be proud of, as usual. 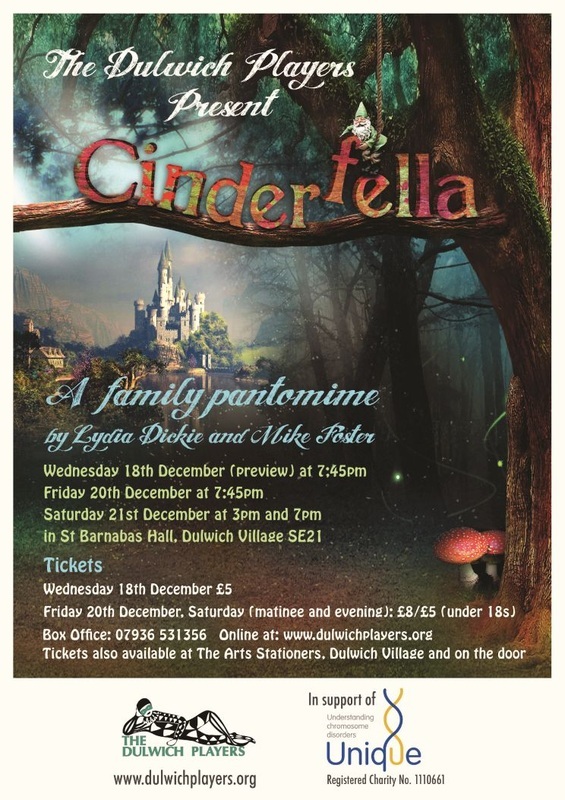 Cinderfella is another example of how the Dulwich Players can write their own material, including scripts, lyrics and music, and pull off a fabulous production in a tight time frame, and perform a week before Christmas! It shows the dedication and commitment of its members. I had a great time, better than I expected, and I hope the cast and crew can take a well-deserved rest now that the production is 'BEHIND YOU! '.